Talk about fuss-free meals! 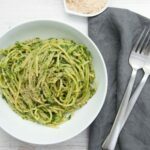 This vegan Wild Garlic Pasta comes together in just 15 minutes! It's the perfect quick & easy lunch or dinner idea during the wild garlic season! Cook the spaghetti in a pot of boiling water according to the package instructions, then drain and reserve a cup of cooking water. While the pasta is cooking, place the rest of the ingredients in a food processor and pulse until it's a nice smooth pesto. You might have to scrape down the sides. Add the pesto to the drained pasta, toss and add 1-2 tablespoon of cooking water to thin out the pesto until all the pasta is coated. Then divide the pasta onto two plates and sprinkle with more nutritional yeast flakes. Enjoy! *If you don't have wild garlic you could alternatively use fresh spinach and add in a garlic clove for a quick pesto pasta dish.